Theme 2018: La Fontaine’s Animal Fables to stories from all over the world, from antiquity to the present day, because the fable comes from an oral tradition long before writing and was transmitted from generation to generation. She has gone through history, she wants to be imaginary, short, in prose and expresses a moral, sometimes implicit. From 2 pm, under the tent of the Colombier, animations for children: make-up, manual activities, competition of disguises child and adult. Ball for children.Defiled animated by the batucada SAMBA GARAGE, the brass band of the big BIDONS, the puppets of the neighbors of the top and sieurRAMPANO! JUDGMENT and LOG of Rampano in front of the cultural centerNouveauté: workshop of manufacture of puppets will take place in the Holm oaks a few days before the carnival and is open to everyone. 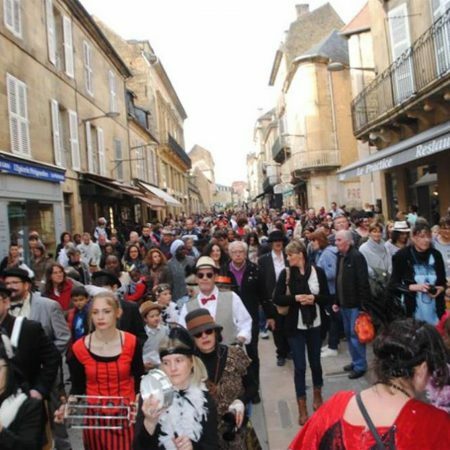 You are visitors, participants in the event: Carnival SARLAT-LA-CANEDA.